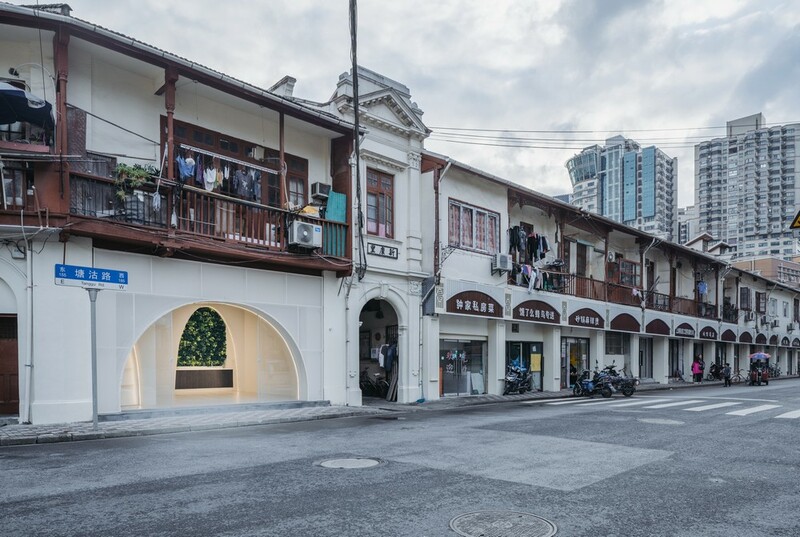 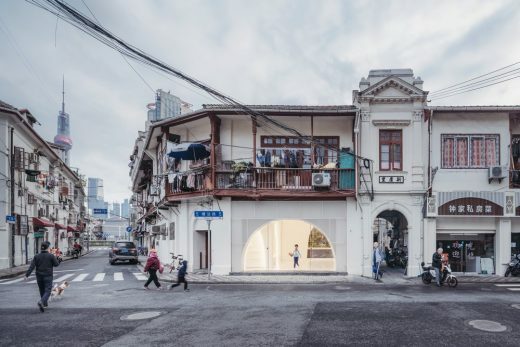 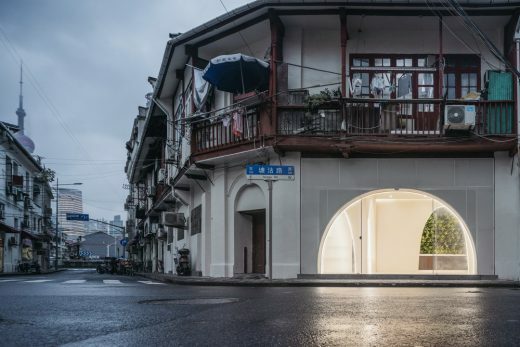 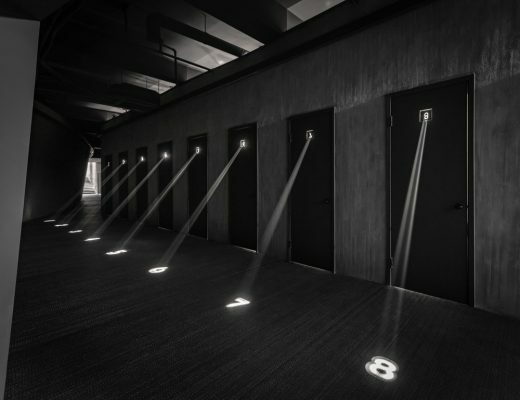 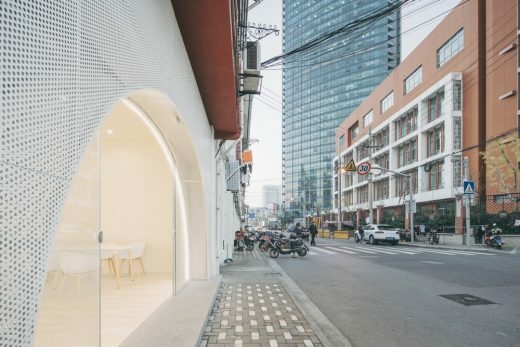 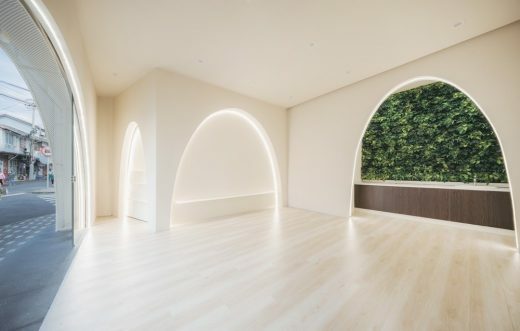 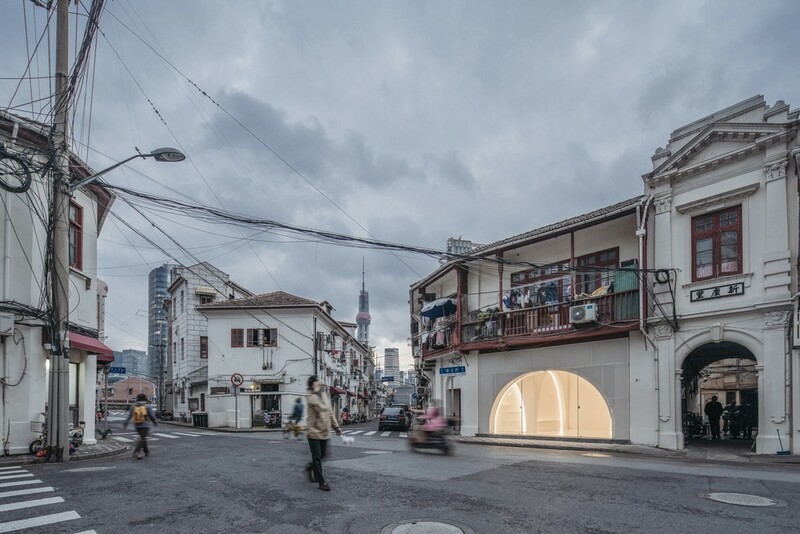 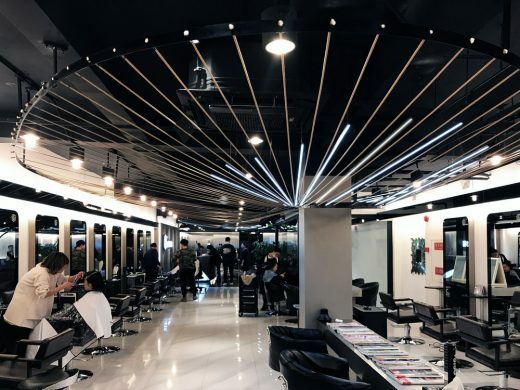 The council of Shanghai North Bund Tanghan Street commissioned Wutopia Lab to construct a common space for the “tiger mums” of the local district. 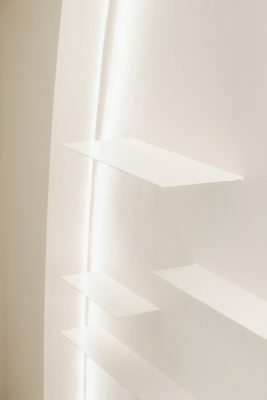 The total area of this project only adds up to 35sqm. Formerly a shopfront for at-home aged-care facilities online shop, the space was mostly empty due to poor management. 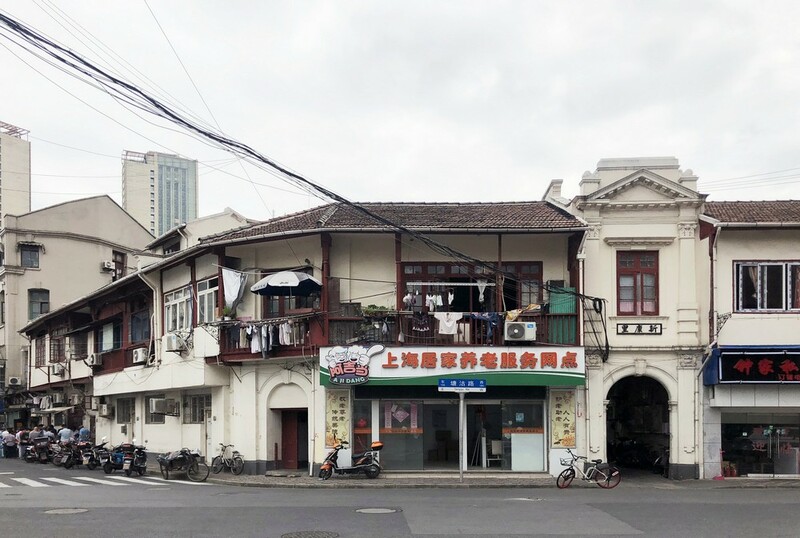 As this building is located right opposite of Beihong Senior Highschool, many parents tend to gather and use this space to converse with each other, help each other pick up the kids and sneak in some casual tutoring, forming a voluntary “tiger mum” group within this small community. The Tanghan Street Council hopes to convert this shopfront into a communal meeting space that encourages the interaction of the parents and the students and introduce tea parties, workshops, and arts and crafts displays, revitalizing this poorly used space to provide a great converging space between the local community and the school. 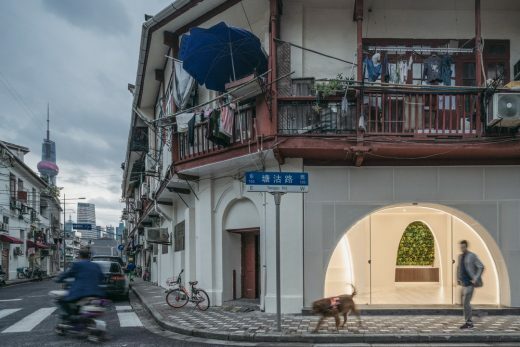 When facing the challenge to design along a messily constructed yet historically rich suburban streetscape, I made my decision in five seconds. 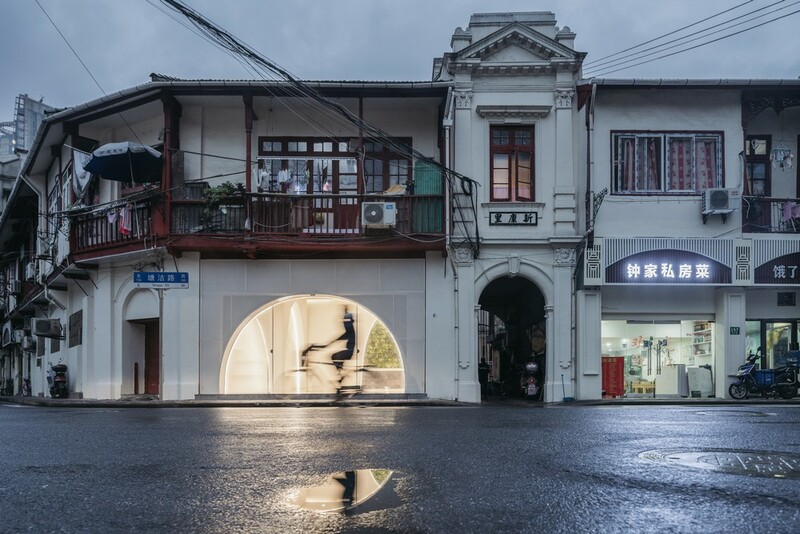 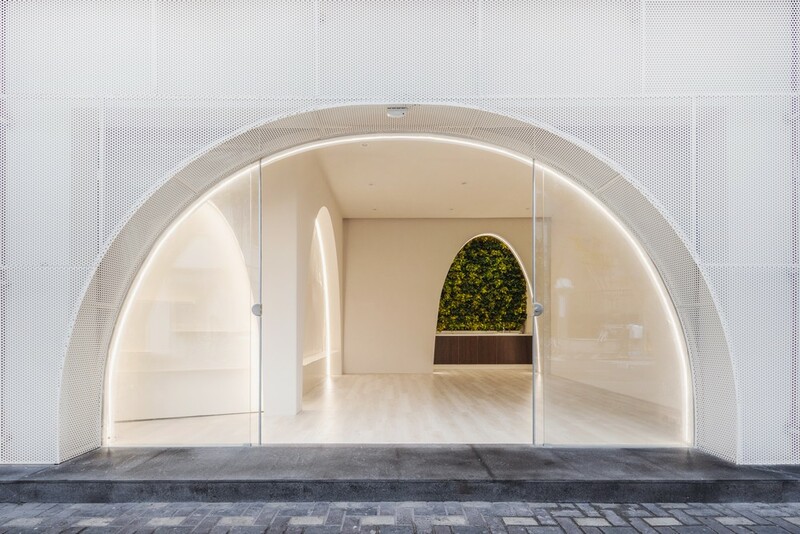 By using an arch that dictates the whole façade, the façade becomes a contrasting next chapter to the existing disordered streetscape. It is the most simple and effective. The irregular site is separated into 3 areas, where the small spaces at the corners are used for storage and a kitchenette. 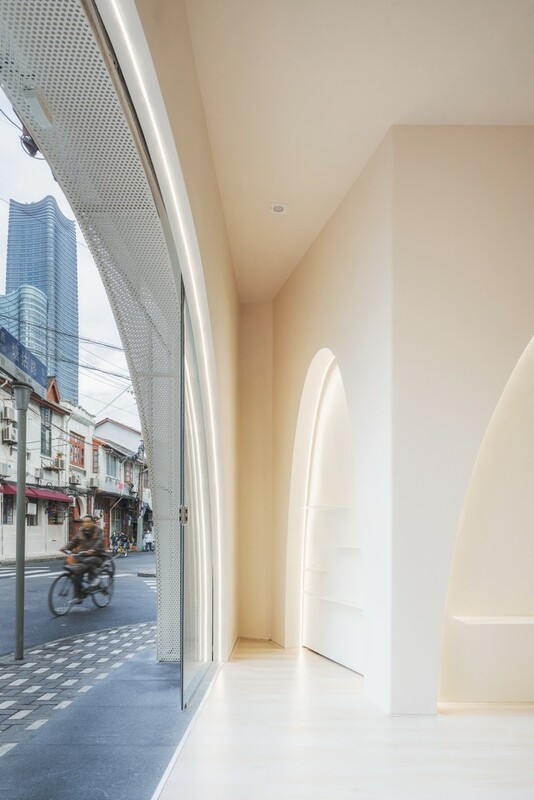 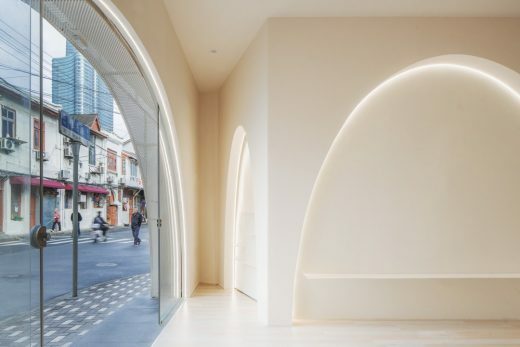 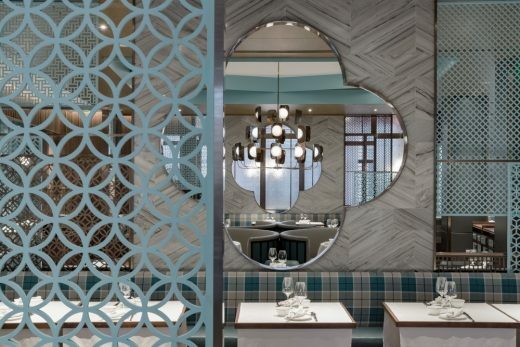 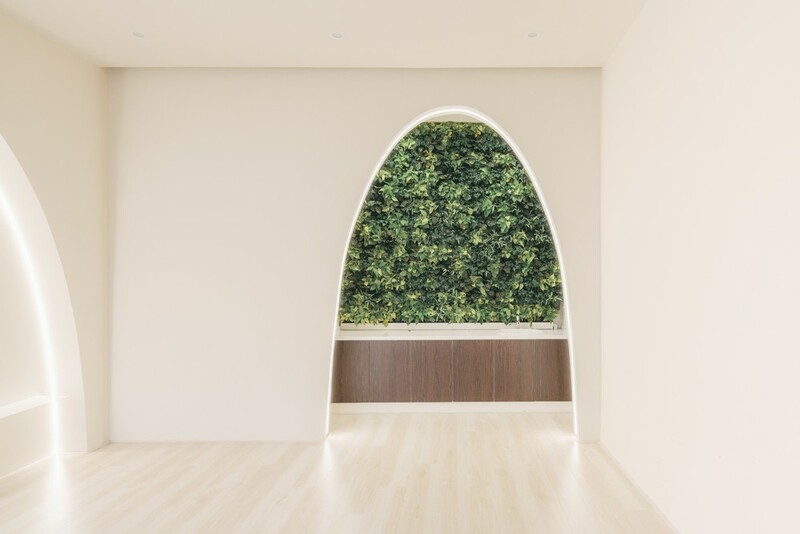 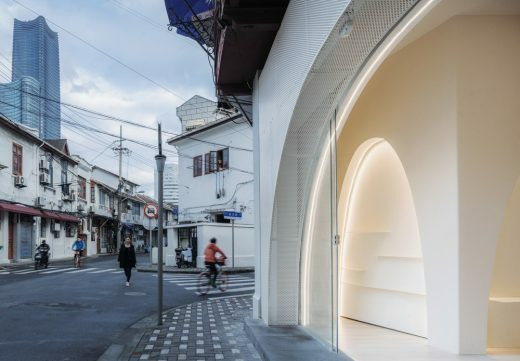 The language of the arch is continued inside, and along with the arch of the exterior façade, a layered visual effect is generated such that even though the area is small, the space seems deep. 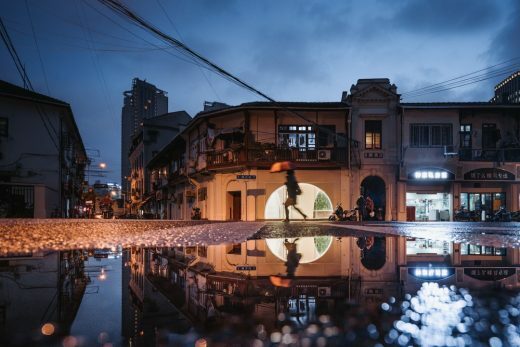 After the rain, the arch is reflected in the puddles on the ground. 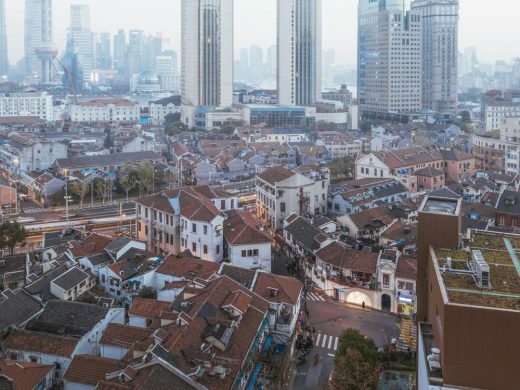 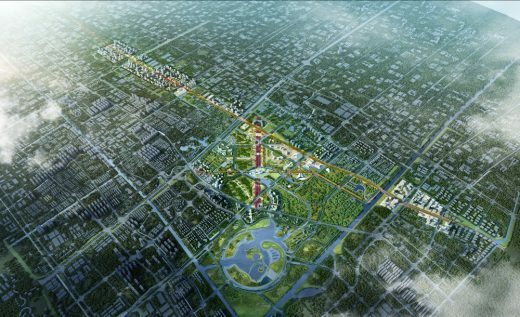 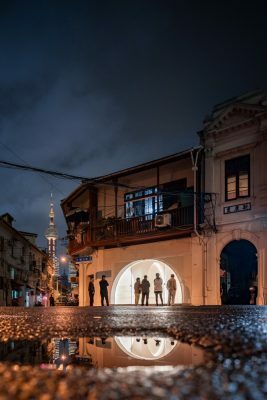 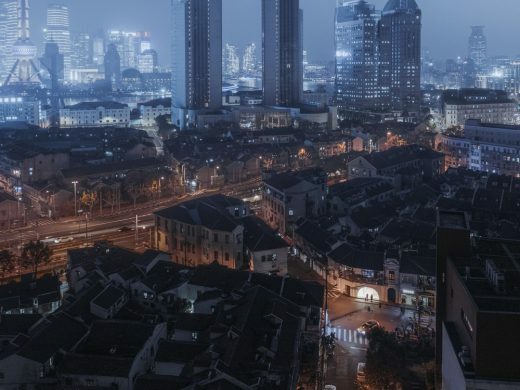 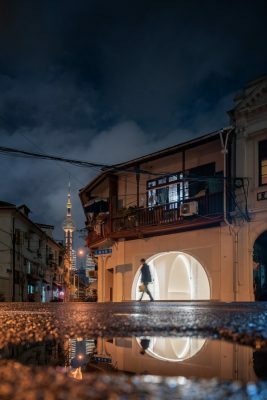 This is when the arch becomes a complete circle, resonating visually with the Oriental Pearl Tower, as if this neglected old district has become part of the modern Shanghai once again. 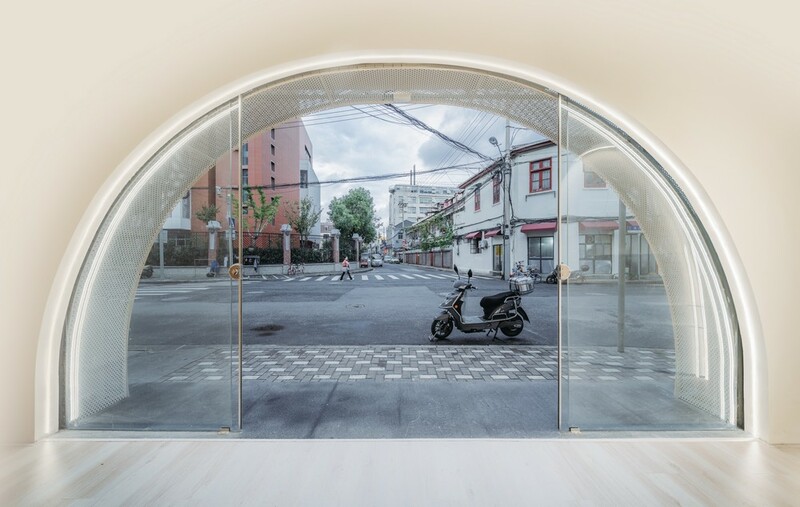 Its visual effect has achieved its maximum potential, despite having such limited space. The photographer captured the building moments after a winter shower and the building, like a full moon, shines upon this old district. Locals gather in front of it, perhaps somewhat proud and hopeful. Convenience and comfort are both essential, but dignity shouldn’t be ignored, because dignity holds the essential human qualities and the spirit that listens to voice of the city.